imed it has hacked into Twitter. The microblogging site was down for nearly an hour, leaving millions in the eastern hemisphere tweetless. The reasoning behind this attack is suspicious, especially as Twitter was a core tool this summer for Iranian protesters to put their story out. 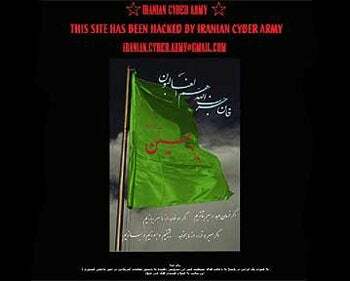 alleged Iranian hackers managed to deface Twitter home page with the message: "This site has been hacked by the Iranian Cyber Army." (as per image above; click on it for a closer look). The reasoning behind the attack is not known as of yet. The group was previously unknown, and some speculate this attack was carried out by pranksters, rather than pro-Iranian campaigners. Graham Cluley, from the Sophos security firm, writes on his blog that the message posted "does not necessarily mean that hackers from Iran are responsible for the defacement." When Iran's presidential election was believed fraudulent this summer, protests turned bloody and the opposition used Twitter to put their message out to world. Actually, Twitter became the leading source of the story, with videos and photos pulled from the site by all major media outlets, which were banned from reporting from inside the country. Twitter also did a favor for the Iranian protesters back in the summer, with intervention from the U.S. State Department. The site delayed a planned maintenance shutdown, only to be able to continue spreading the message of the Iran protests turned bloody. The events in Iran were also the biggest trending topic in the news category on Twitter this year, followed by swine flu and Gaza. Twitter helped the people of Iran to put their message out when nothing else could. The reasoning behind the alleged hackers, the Iranian Cyber Army, several months later is nothing short of strange.